Topic: Music from the Kabuki Theater. Contemporary Music and Dance. Special Guest Artist – Sachiyo Ito. Nami Kineie is well known to Japanese audiences for her frequent performances of both the traditional Nagauta style of shamisen, and her dedication to performing contemporary music. The program for October 10 will include several classic Kabuki Theater pieces (Suehirogari, Sagimusume) plus contemporary music by Seiho Kinea, James Nyoraku Schlefer and Etsuo Kawasaki. Accompanying Ms. Kineie on several pieces will be her top student Sakurako Satoh and she is delighted to be joined on one piece by the venerable shamisen master Kineya Shozuko. Additionally two well known New York based artists will perform with her – dancer Sachiyo Ito and shakuhachi master James Nyoraku Schlefer. With master choreographer Sachiyo Ito. 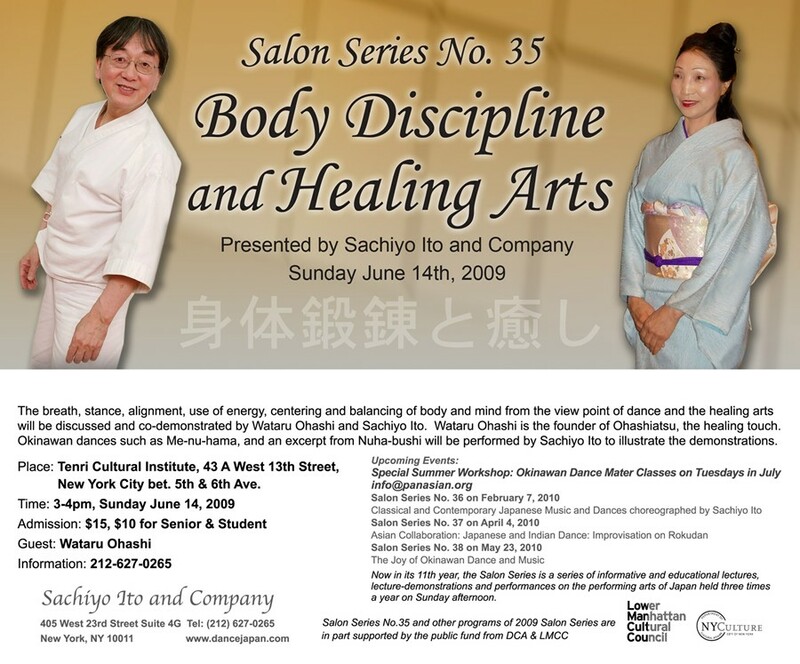 The breath, stance, alignment, use of energy, centering and balancing of body and mind from the view point of dance and the healing arts will be discussed and co-demonstrated by Wataru Ohashi and Sachiyo Ito. Wataru Ohashi is the founder of Ohashiatsu–the healing touch based on eastern methods and philosophy. 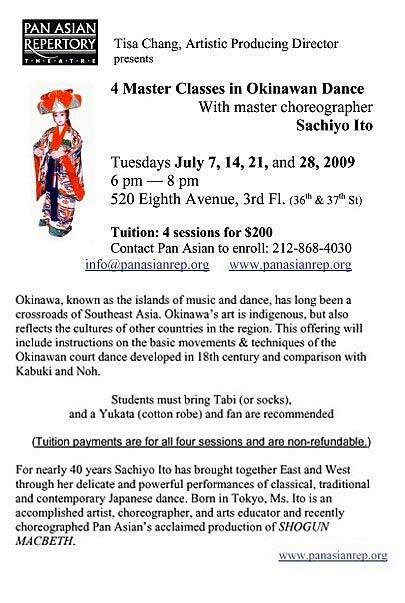 Okinawan dances such as Me-nu-hama, and an excerpt from Nuha-bushi will be performed by Sachiyo Ito to illustrate the above demonstrations. Now in its 11th year, the Salon Series is a series of informative and educational lectures, lecture-demonstrations and performances on the performing arts of Japan held three times a year on Sunday afternoons at Tenri Cultural Institute. Gagaku with Tenri Gagaku Society: A world premier of “Kashin,” choreographed by Sachiyo Ito, will be performed by Sachiyo Ito and Company. Sanshin, the Okinawan three-stringed instrument, was first introduced from China in the 14th Century. Sanshin and Shamisen players will talk about the instruments and their music traditions, and demonstrate how they are played. Okinawan dance accompanied by sanshin and Jiuta-mai dance accompanied by shamisen will be performed.